August 2011 I met with 154 Central Coast Chapter Rare Fruit Growers at the home of Clifford Chapman in Shell Beach, CA. After the meeting Joe Sabol with Cal Poly, SLO asked about the L. E. Cooke Co growing Mr. Chapman’s seedling peach. Several people spoke of the quality and great flavor. They went west of the home into the sand from the beach and cut budwood for me to take to Visalia. I was interested because this seedling next to the ocean had to be very low chill. The L. E Cooke Co budded and in December 2012 dug 24 trees. January 11, 2013 we plant 5 of the trees in Cooke 2 orchard and took the balance to Joe Sabol at Cal Poly. Mr. Chapman had died that year so never received his. These trees were all very large which is common for those requiring very little chill as they leaf earlier and grow longer. 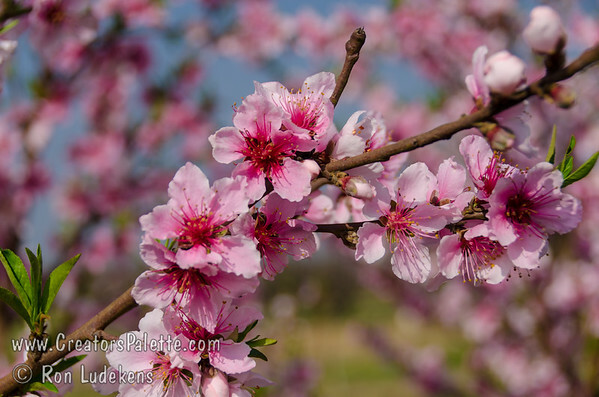 March 2014 the Peachy Keen, (Chapman) peach was the first to flower along with Flordaprince making it a 150 to 200 hour peach or mildest peach in our collection. The five trees had a mass of very large pink flowers for a first year and I assumed most would not develop. 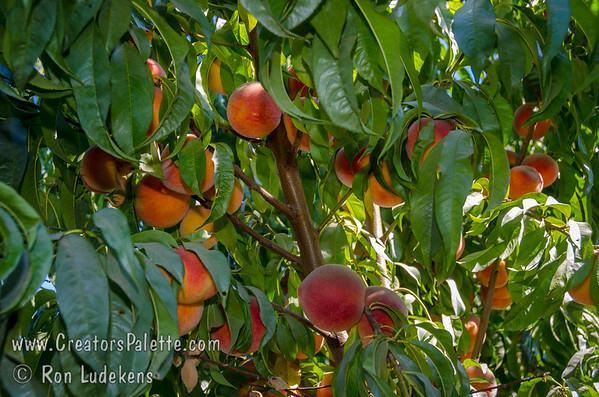 Early July every tree had close to 100 peaches supplying our sales and office staff and many field employees. Note - this is on a tree planted in the ground for only 1.7 years. We picked fruit over a 3 week period with very good flavored peaches. All fruit size was medium to large and would have been very large if we had thinned the trees. The trees were way overloaded. I recorded the peak ripening date as July 7. We had already picked for a week and continued picking for two more weeks. Flower: very large, colorful, full bloom 2/15 with Flordaprince. Based on bloom date, I list as a 200 hour chill need, possibly 150 hours. Fruit: sets heavy like a Babcock so medium size fruit. With thinning, Peachy Keen peach will produce large fruit. Very good flavor as I had been told at the Rare Fruit Growers meeting by several people. The skin is very colorful red 90% except in stem area. Texture: solid, firm, good flavor, red at pit and very freestone. Easy to cut without getting juice all over you, yet flesh moist. Pit is small. The selection appears promising for a lunch fruit because of firm flesh similar to an apple. Peachy Keen peach is a very unusual tree and fruit. It is a healthy grower because starts early due to low chill need, large colorful and long lasting flowers. The variety has a heavy set of very colorful fruit with firm moist tasty flesh and very freestone. A tree only 18 months from planting with over 100 peaches is remarkable. 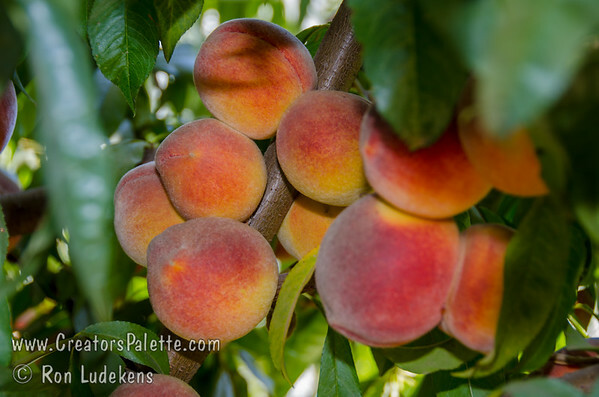 January 10, 2015, the sales staff renamed the Chapman peach to Peachy Keen® Peach. There has been confusion on persimmons. Our United States American persimmon was not very edible so the market production of fruit was slow and the public showed no interest to sample. Japan and China grew the persimmon and the Japanese sold them in Europe. By the time these arrived in California, the names were mixed and new crosses and rootstock confusion. Orange County Nursery became the major persimmon grower for the United States nurseries. The L. E. Cooke bought from Orange County into the 1970’s, as did most all others. The Orange County owners made trips to Japan to bring back new selections. California through UC Davis and the Persimmon Association brought in Kay Ryugo for most of a year to study all the California persimmons. The persimmon we were and still sell for Fuyu (Jiro) Persimmon is what he called a “California Fuyu”. No need to change because all farmers know it as Fuyu (Jiro). Unfortunately the early market persimmons were the American or Hachiya which need to be eaten fully ripe or it was very astringent. Even still today, many people are hesitant to eat a persimmon. Persimmons are now well accepted in California, but most of the rest of the country only knows or heard about the American or Hachiya. I am amazed at the nursery people who will not sell a persimmon because of the “bitter” fruit. 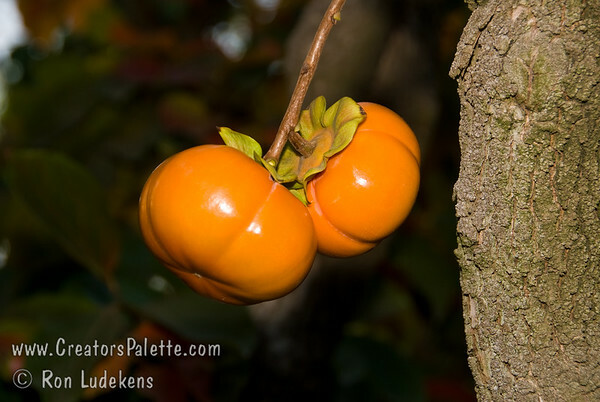 If you visit the L. E. Cooke Co in the fall, I attempt to have a visitor sample a Fuyu Persimmon. What a surprise when they want to take a box of fruit home. We brought seven varieties from Japan to avoid some of the confusion and uncertainty of names in California sources. Several were lost in travel and quarantine. All were here previously so we did not “introduce” any except for FUYU (IMOTO) PERSIMMON. The facts are basically the same as Fuyu (Jiro) except a little larger and about 7-10 days earlier. The Imoto selection came from the late Mr. Mike Imoto in Lindsay. We grew it for him and he allowed the company to add it to our catalog. I assume Imoto is a California Fuyu sport. The Fuyu (Imoto) Persimmon advantage is slightly larger and earlier fruiting. The L. E. Cooke Co introduced Fuyu (Imoto) in 1985. The Golden Nectar Plum is patent #4977, granted January 25, 1983. The plum is a seedling from a Mariposa Plum orchard in Exeter. The Golden Nectar was discovered by Bill Hengst. 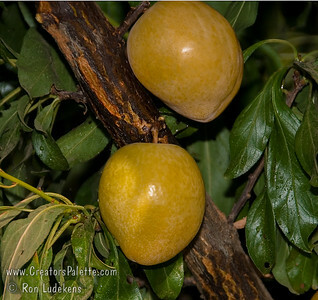 This gold plum is the most unusual to be introduced. First the parent is an all red skin and flesh Japanese plum. There is no resemblance to the parent tree. The L. E. Cooke Co was fortunate to learn about this tree. A family I grew up with in Alhambra, California had a cabin in Mineral King. They spent much time with the Hengst family. One summer when the family was in our area, I was called and the suggestion made I should see this new seedling which was to be patented. We were provided budwood to grow trees for the orchard but could not sell until patent was granted. This gave us time to study the tree and fruit. The tree is a fast grower and fruited in its second year. We started production in 1985 and began sales in 1987. Golden Nectar is a unique extra large unforgettable eating delight. The skin is golden amber with a thin wax and tender texture. The flesh is amber, firm with excellent flavor. The pit is very small freestone, leaving quantities of flesh for eating and drying. The fruit keeps well on the tree and in storage at room temperature. The fruit ripens in late July. The Golden Nectar Plum was entered in the County Fair two years consecutively and was awarded first place each time. Tulare is a plum growing county, so in competition with some of the best plums. Chilling is approximately 400 to 500 hours and sets well in most of southern California. The large size, freestone pit, and thin skin make it a good seller, plus the freestone make for great halves for drying. This is a L. E. Cooke Co. introduction.